Better late than never right? I feel like this past month was so wrapped up in Christmas it's almost hard to separate everything. I'll let the picture do the most of the talking since I seem to be out of words today. I can tell this month is going to be a big one. The amount of changes that have already taken place over the past 11 days has been mind blowing! You never cease to amaze me Ethan! So handsome! Sounds like he is all boy with the sticks and ear explorations! It sounds cliche, but it really is so magical to watch them grow! that's a gorgeous picture!! he is so so handsome. they would be best buds. He is so very cute. This stage in their life flies, so enjoy it! Wow! He is just beautiful! Your son is adorable. I have a 13 month old son and he's pretty much into everything as well although he's not yet walking on his own. By the way. I tried looking for your email address (but did not find it on here) to say that I wanted to follow you on pinterest but the link you have on here is not working. Blessings. inanimate is a big word for his monthly update - ha ha! Love the expression on his face. So cute! That picture is beautiful! 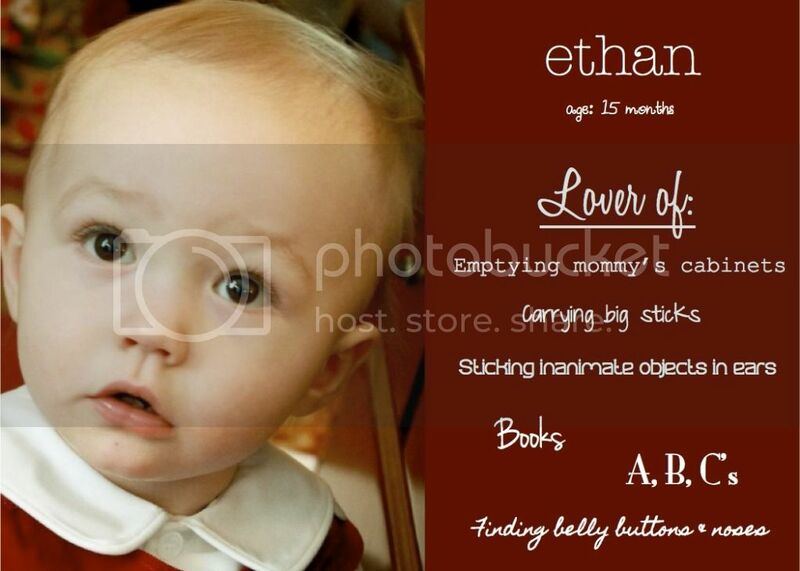 Happy 15 mos Ethan!